On Tuesday, January 24, I testified at a congressional hearing on the Occupy DC protest in McPherson Square in the District of Columbia. 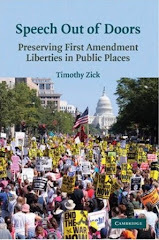 I was invited by the committee on behalf of the democratic minority members, who wanted to have a First Amendment scholar address the importance of public protest in public places and the Park Service's enforcement of its regulations concerning public demonstrations. It was a really interesting experience and a very substantive discussion, for the most part, about the limits of public protest. You can watch the video here.